If you have a missing or damaged tooth, you may be self-conscious about your smile and appearance and may also have difficulty biting and chewing. A dental crown can often help improve your smile while also helping your tooth to function well. In this blog, the doctors at Dental365 in Long Island and NYC explain more about what a dental crown is. A dental crown is a fixed prosthetic device that’s used to entirely cover a damaged tooth. It can also be placed on top of a dental implant to help it function and look like a real tooth. Crowns are made using different materials, such as porcelain or ceramic, which are often used for front teeth since their color can be matched to that of your natural teeth. For back teeth, Zirconium, a white material that is as strong as metal are often used. Crowns can also be used on children who still have their primary teeth. They can help protect primary teeth that have been damaged by decay and can’t support a filling. Usually, two visits are needed – one to examine and prepare the tooth, and a second visit to place the permanent crown. Your dentist will examine your tooth, possibly taking some X-rays. In some cases, such as when a tooth has extensive decay, he or she may need to perform a root canal. Your tooth and its surrounding gum tissue will be numbed. Then, depending on the condition of your tooth, it may need to be filed down or built up using a filling material to help accommodate a crown. 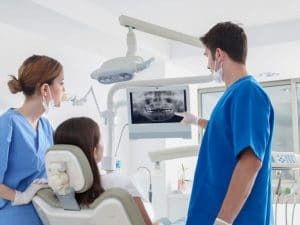 An impression or scan of your tooth will be made, and the same is done for teeth above and below where your crown will be placed to ensure that your bite will not be affected. While a lab manufactures your permanent crown, a temporary one will be used to protect your tooth in the meantime. When your dentist receives your permanent crown, you’ll return to the office, and its fit and color will be checked. Your tooth will again benumbed, and your permanent crown will be securely placed. If you have a damaged tooth or need other dental care, call or visit one of Dental365’s offices today. Our expertly trained specialists and general dental practitioners offer care seven days a week, including extended business hours on weekdays. We’ll provide the high level of experienced care you need for services such as dental crowns.